Gua-Sha is among the most popular beauty trends of 2018. With the year coming to an end and also the full moon (December 22nd), a Gua-Sha treatment has never been more beneficial as a high vibrational self-care technique and ritual. I don't know about you but around the full moon my body asks for more self-care then I can sometimes fit in my schedule. During these testing times, my body needs extra beauty sleep and I find it much harder to stay grounded. One very powerful tip I've learned on my path is to not dwell in this but embrace it all, and find ways that keep me grounded. With the proper self-care techniques, I am quickly taken back to calmness, which in turn means healthy glowing skin...it all starts within! Gua Sha is a technique that involves gently pulling a crystal tool along the skin, stimulating all of its layers. Having stood the test of time, and being passed down for centuries from ancient Chinese Empresses to the modern day goddess. 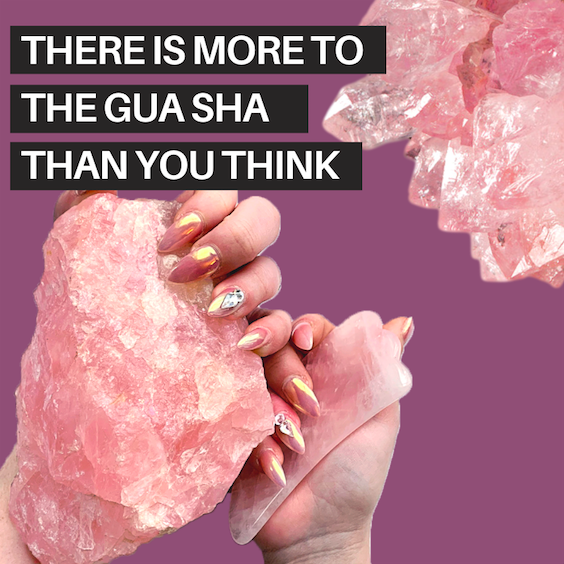 There are so many amazing beauty benefits when it comes to the Gua-Sha, but there are also many benefits for the mind which is overlooked and not talked about as much. 1. Grounding Technique. When you are grounded, you are aware of what’s happening in the moment. You are energetically connected to the earth. Your feet feel the ground beneath them. You sense a physical and energetic connection between all of your body parts: your head feels connected to your neck, your neck feels connected to your torso, and so on. When properly grounded, you can more easily handle emotional issues (your own or someone else’s) with self-possession and awareness. Grounding techniques such as Gua-Sha can be helpful in managing overwhelming feelings or intense anxiety. It can help someone to regain their mental focus from an often intensely emotional state. 3. Attracts more love into your life. Love is the most powerful energy in the universe. Rose quartz is known as the stone of universal love. 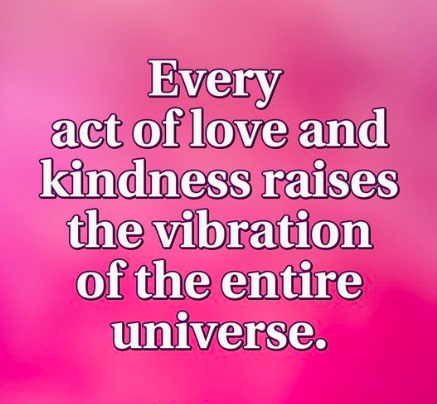 It is believed to help open up your heart and attract love of every kind- self-love, familial love, friendship love, love for humanity or romantic love. 4. Heals the heart. Rose Quartz is known for its heart healing properties. The love and healing vibrations help replace toxic emotions and blockages that clogs the heart chakra and replaces it with the energy of love. The vibrations of love emitted from the stone helps to unblock the energy that clogs the heart chakra, letting go of stress and negativity that can cause tension in the muscles that creates fine lines and wrinkles. 5. Relieving Stress. Feelings of stress and anxiety can sometimes cause you to inadvertently clench your jaw or grind your teeth while you’re asleep. You may also hold your jaw in a clenched position while you’re awake without being aware of it. These actions can cause feelings of tightness in the jaw and pain during sleeping and waking hours. Gua-Sha is amazing at relieving jaw tension. 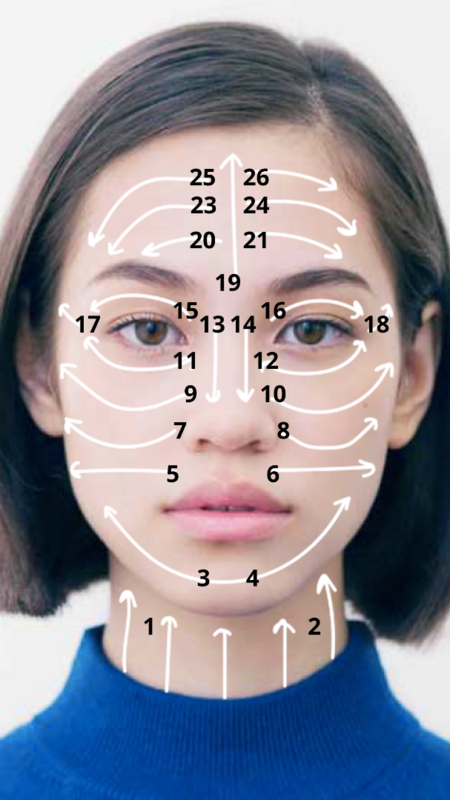 We hold so much tension in our faces/ jaw/ neck, and it’s often not until you get a proper jaw massage or start a gua sha protocol that you realize it. By incorporating gua sha into your routine (ideally every day) you will notice a dramatic release of tension in the TMJ area, as well as all the physical perks. Clean your face and pat dry sending love to every cell. Spray a few spritzes of your favorite toner and tap into the skin until its fully absorbed. Use 4-5 drops of your favorite facial oil, press into the skin on face and neck, before further massaging the oil into the skin in upward motions. With the Gua Sha, begin to work on face/neck in motions as illustrated in the photo below. The image above will help guide you through the general motions, starting at 1 with the neck, and working your way up. Get your own Gua-Sha tool here.